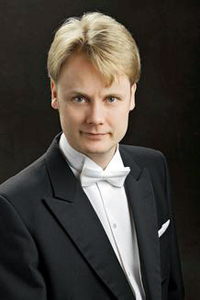 Pasi Hyökki has been the new conductor of the YL Male Voice Choir since 2010. In addition, he is the founder and artistic director of the Talla Vocal Ensemble, and also conductor of the Tapiola Choir, the world-famous children's choir, and of the EMO Ensemble mixed choir. Pasi Hyökki completed his choir conducting studies at the Sibelius Academy, where he now teaches the history of choral music. His merits include first prize in the first international Harald Andersén Chamber Choir Competition in 2003, in addition to first prize at the 2001 "In... Canto sul Garda" Competition in Italy and the conductor prize at the international Chorus Review at the Tampere Vocal Music Festival in 1997. He is also a sopranista singer and has studied with Claudine Ansermet, Christina Miatello and Gloria Arbitelli.